Here is a selection of paintings by Award winning Artist Richard Edwards. Come by the gallery this season to view his latest works! 454 Newburn Road, RR #1 Kagawong. Serigraphy, also called silk-screening or screen printing, is a perfection of early types of stencil printing used in ancient times. Around 1938 a group of New York artist began experimenting with silkscreen as a medium for creating original works of art. They produced original prints which made there way into exhibitions and museums. The new art was given a new name “serigraphy” (Seri means silk). The words serigraph and serigraphy are reserved for the fine art aspect of silk screen printing and the medium has been widely accepted as one of the graphic arts worthy of the attention of printmakers and collectors. An original print is a work of art. The artist alone has created the master image on plate, stone, wood or silk for the purpose of creating the print. The finished print is approved, signed and numbered by the artist. After production the master image is marked or destroyed. With Richard’s serigraphs, a master image is drawn on a silkscreen, which is stretched on a wooden frame. With a ‘resist’, a negative is painted on this screen. The screen is laid directly on a piece of paper and a pigment is pressed through the screen creating the image in oil paints on 100% cotton paper beneath. Each colour is called a ‘pull’ and the final serigraph may be the result of 20 or more pulls. It may take a month to complete a serigraph and when finished the master image is cleaned off the screen which prevents any further additions to the series. 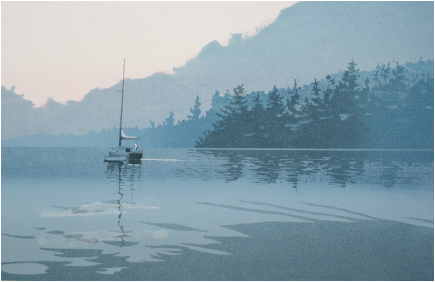 Richard Edwards studied printmaking and painting at the Ontario College of Art and Design in Toronto. Since graduating with honours in 1970 he has known no other occupation then painter and printmaker. On location he sketches and paints directly from nature. This work is used later for the basis of painting and serigraphs produced in the studio. He currently works from Edwards Studios in the Historical Old Mill in Kagawong on Manitoulin Island.